Preparing for a May 2016 event at the Hunan International Conference and Exhibition Center, Changsha. The 7th China Satellite Navigation Conference and exhibition will take place at the Hunan International Conference & Exhibition Center in Changsha (長沙), the 3,000 year old capital city of Hunan Province on May 18, 19 and 20, 2016. Several thousand scientists, GNSS businesses and researchers from all over the world are expected to attend this high-level annual event. The conference language will be Mandarin, with simultaneous English translation. 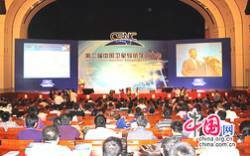 The CSNC is organzed by the Academic Exchange Center of China’s Satellite Navigation Office (CSNO) and supported by eleven national agencies, including Beidou system administration. The chair of the scientific committee is Sun Jiadong ( 孙家栋), general designer of the Chinese Lunar Exploration program.